Malbec is a purple grape variety used in making red wine. The grapes tend to have an inky dark colour and robust tannins, and are known as one of the six grapes allowed in the blend of red Bordeaux wine. The French plantations of Malbec are now found primarily in Cahors in South West France. It is increasingly celebrated as an Argentinian varietal wine and is being grown around the world. A popular but unconfirmed theory claims that Malbec is named after a Hungarian peasant who first spread the grape variety throughout France. However the French ampelographer and viticulturist Pierre Galet notes that most evidence suggest that Côt was the variety’s original name and that it probably originated in northern Burgundy . Despite a similar name, the grape Malbec argenté is not Malbec, but rather a variety of the southwestern French grape Arbouriou. The Malbec grape is a thick-skinned grape and needs more sun and heat than either Cabernet Sauvignon or Merlot to mature. 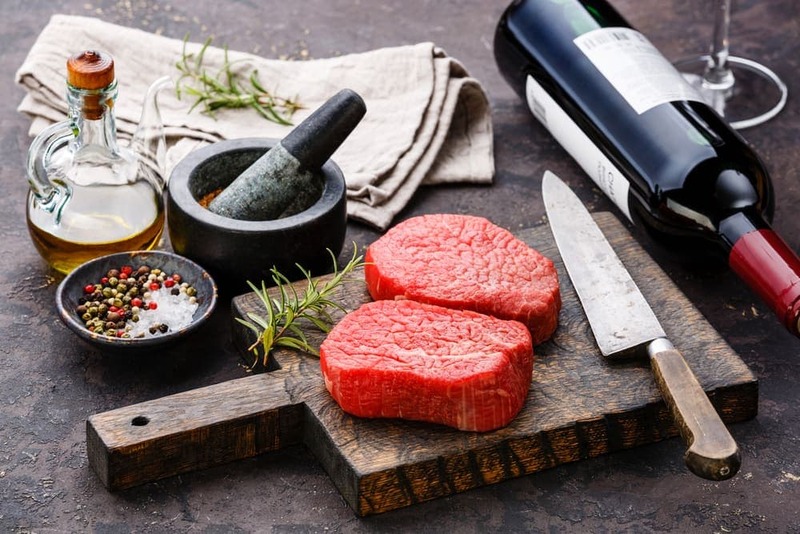 The rarer a steak is the more it will lessen the sensation of tannin in any accompanying wine. So if you have a young or comparatively young cabernet sauvignon or malbec, for instance, a rare steak will make it taste more mellow. Our fine Malbec makes the perfect accompaniment to our 28 day aged steaks.